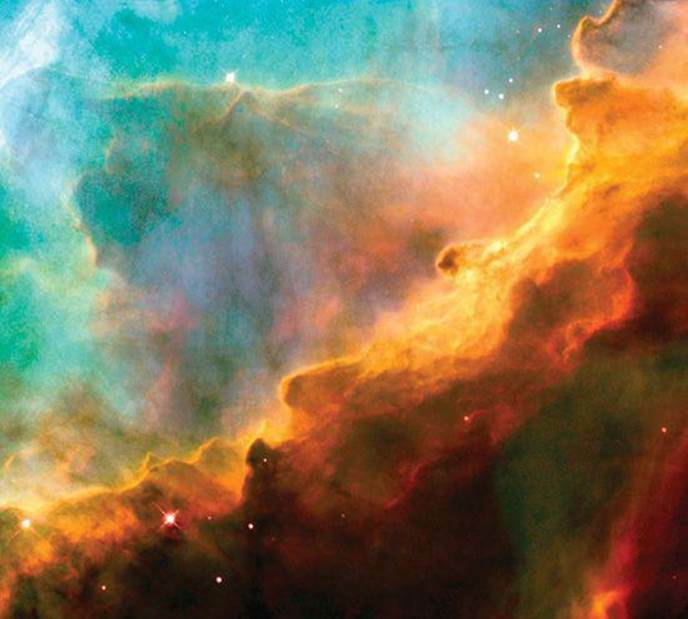 HUBBLE SPACE TELESCOPE IMAGE of the Omega Nebula, a 15-light-year-wide expanding remnant of a star's supernova explosion. The orange filaments are the tattered remains of the star and consist mostly of hydrogen, the simplest and most plentiful element in the universe. Hydrogen occurs as molecules in cool regions of the nebula, as atoms in hotter regions, and as ions in the hottest regions. The processes that occur within stars are responsible for creating other chemical elements from hydrogen. We begin with a brief description of what chemistry is, what chemists do, and why it is useful to learn chemistry. Next, we examine some fundamental ways to classify matter, distinguishing between pure substances and mixtures and between elements and compounds. We then consider different characteristics, or properties, used to characterize, identify, and separate substances. We observe that many properties rely on quantitative measurements involving numbers and units. The units of measurement used throughout science are those of the metric system. We observe that the uncertainty inherent in all measured quantities is expressed by the number of significant figures used to report the quantity. Significant figures are also used to express the uncertainty associated with calculations involving measured quantities. We recognize that units as well as numbers are carried through calculations and that obtaining correct units for the result of a calculation is an important way to check whether the calculation is correct. HAVE YOU EVER WONDERED why the stars shine? Or why leaves change color in the fall or how a battery generates electricity? Have you ever wondered why keeping foods cold slows their spoilage and how our bodies use food to maintain life? Chemistry answers these questions as well as countless others. Chemistry is the study of matter and the changes that matter undergoes. One of the joys of learning chemistry is seeing how chemical principles operate in all aspects of our lives, from everyday activities like cooking dinner to more complex processes like the development of drugs to cure cancer. Chemical principles also operate in the far reaches of our galaxy (chapter-opening photograph) as well as within and around us. This first chapter provides an overview of what chemistry is about and what chemists do. The preceding “What's Ahead” list gives an overview of the chapter organization and of some of the ideas we will consider. As you study, keep in mind that the chemical facts and concepts you are asked to learn are not ends in themselves; they are tools to help you better understand the world around you. Before traveling to an unfamiliar city, you might look at a map to get some sense of where you are heading. Because chemistry may be unfamiliar to you, it's useful to get a general idea of what lies ahead before you embark on your journey. In fact, you might even ask why you are taking the trip. Chemistry is the study of the properties and behavior of matter. Matter is the physical material of the universe; it is anything that has mass and occupies space. A property is any characteristic that allows us to recognize a particular type of matter and to distinguish it from other types. This book, your body, the air you are breathing, and the clothes you are wearing are all samples of matter. Countless experiments have shown that the tremendous variety of matter in our world is due to combinations of only about 100 substances called elements. As we proceed through this text, we will seek to relate the properties of matter to its composition, that is, to the particular elements it contains. Chemistry also provides a background for understanding the properties of matter in terms of atoms, the almost infinitesimally small building blocks of matter. Each element is composed of a unique kind of atom. We will see that the properties of matter relate to both the kinds of atoms the matter contains (composition) and to the arrangements of these atoms (structure). In molecules, two or more atoms are joined together in specific shapes. Throughout this text you will see molecules represented using colored spheres to show how the atoms are connected ( FIGURE 1.1). The color provides a convenient way to distinguish between atoms of different elements. For example, notice that the molecules of ethanol and ethylene glycol in Figure 1.1 have different compositions and structures. Ethanol contains one oxygen atom, depicted by one red sphere. In contrast, ethylene glycol contains two oxygen atoms. 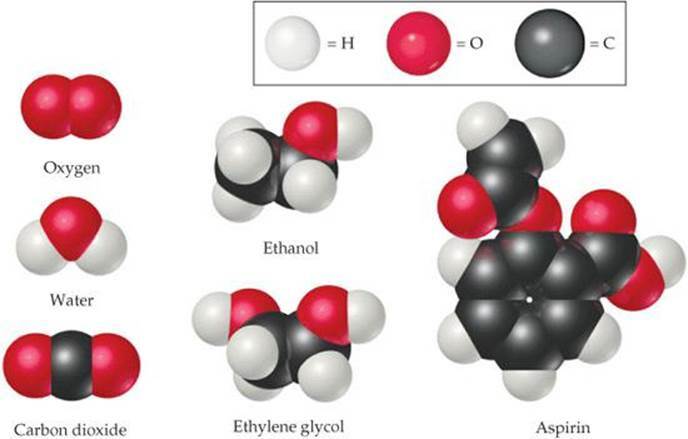 How many carbon atoms are in one aspirin molecule? FIGURE 1.1 Molecular models. The white, black, and red spheres represent atoms of hydrogen, carbon, and oxygen, respectively. Even apparently minor differences in the composition or structure of molecules can cause profound differences in properties. Ethanol, for example, is the alcohol in beverages such as beer and wine, whereas ethylene glycol is a viscous liquid used as automobile antifreeze. The properties of these two substances differ in many ways, as do their biological activities. Ethanol is consumed throughout the world, but you should never consume ethylene glycol because it is highly toxic. One of the challenges chemists undertake is to alter the composition or structure of molecules in a controlled way, creating new substances with different properties. Every change in the observable world—from boiling water to the changes that occur as our bodies combat invading viruses—has its basis in the world of atoms and molecules. Thus, as we proceed with our study of chemistry, we will find ourselves thinking in two realms: themacroscopic realm of ordinary-sized objects (macro = large) and the submicroscopic realm of atoms and molecules. We make our observations in the macroscopic world, but in order to understand that world, we must visualize how atoms and molecules behave at the submicroscopic level. Chemistry is the science that seeks to understand the properties and behavior of matter by studying the properties and behavior of atoms and molecules. a. Approximately how many elements are there? b. What submicroscopic particles are the building blocks of matter? Chemistry greatly impacts our daily lives. Indeed, chemistry lies near the heart of many matters of public concern: improvement of health care, conservation of natural resources, protection of the environment, and provision of our daily needs for food, clothing, and shelter. Using chemistry, we have discovered pharmaceutical chemicals that enhance health and prolong lives. We have increased food production through the use of fertilizers and pesticides, and we have developed plastics and other materials used in almost every facet of our lives, from electronics to sporting equipment to building construction. 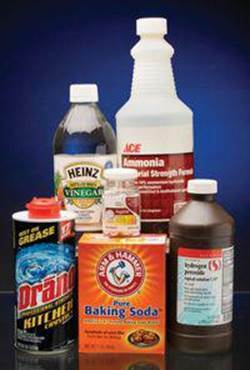 Unfortunately, some chemicals can harm our health or the environment. As educated citizens and consumers, it is in our best interest to understand the profound effects, both positive and negative, that chemicals have on our lives and to strike an informed balance about their uses. Most of you are studying chemistry, however, not merely to satisfy your curiosity or to become more informed consumers or citizens but also because it is an essential part of your curriculum. Your major might be chemistry, but it could be biology, engineering, pharmacy, agriculture, geology, or some other field. Why do so many subjects share an essential tie to chemistry? The answer is that chemistry is the central science, central to a fundamental understanding of other sciences and technologies. For example, our interactions with the material world raise basic questions about the materials around us. What are their compositions and properties? How do they interact with us and with our environment? How, why, and when do materials undergo change? These questions are important whether the material is part of a solar cell, a pigment used by a Renaissance painter, or a living creature ( FIGURE 1.2). FIGURE 1.2 Chemistry helps us understand the world around us. (a) Solar cells are made of silicon. (b) A Renaissance painting, Young Girl Reading, by Vittore Carpaccio (1472–1526), uses pigments that keep their color for years. (c) The light from this firefly is the result of a chemical reaction within the animal. By studying chemistry, you will learn to use the powerful language and ideas that have evolved to describe and enhance our understanding of matter. Furthermore, an understanding of chemistry provides powerful insights into other areas of modern science, technology, and engineering. Chemistry is all around us. Many people are familiar with household chemicals such as those shown in FIGURE 1.3, but few realize the size and importance of the chemical industry. Worldwide sales of chemicals and related products manufactured in the United States total approximately $550 billion annually. The chemical industry employs more than 10% of all scientists and engineers and is a major contributor to the US economy. Vast amounts of chemicals are produced each year and serve as raw materials for a variety of uses, including the manufacture and processing of metals, plastics, fertilizers, pharmaceuticals, fuels, paints, adhesives, pesticides, synthetic fibers, and microprocessor chips. TABLE 1.1 lists the top eight chemicals produced in the United States. Who are chemists, and what do they do? People who have degrees in chemistry hold a variety of positions in industry, government, and academia. Those in industry work as laboratory chemists, developing new products (research and development), analyzing materials (quality control), or assisting customers in using products (sales and service). Those with more experience or training may work as managers or company directors. Chemists are important members of the scientific workforce in government (the National Institutes of Health, Department of Energy, and Environmental Protection Agency all employ chemists) and at universities. A chemistry degree is also good preparation for careers in teaching, medicine, biomedical research, information science, environmental work, technical sales, work with government regulatory agencies, and patent law. Fundamentally, chemists do three things: (1) make new types of matter: materials, substances, or combinations of substances with desired properties; (2) measure the properties of matter; and (3) develop models that explain and/or predict the properties of matter. One chemist, for example, may spend years working in the laboratory to discover new drugs. Another may concentrate on the development of new instrumentation to measure properties of matter at the atomic level. Other chemists may use existing materials and methods to understand how pollutants are transported in the environment or how drugs are processed in the body. Yet another chemist will develop theory, write computer code, or run computer simulations to understand how molecules move and react on very fast time scales. The collective chemical enterprise is a rich mix of all of these activities. FIGURE 1.3 Common household chemicals.